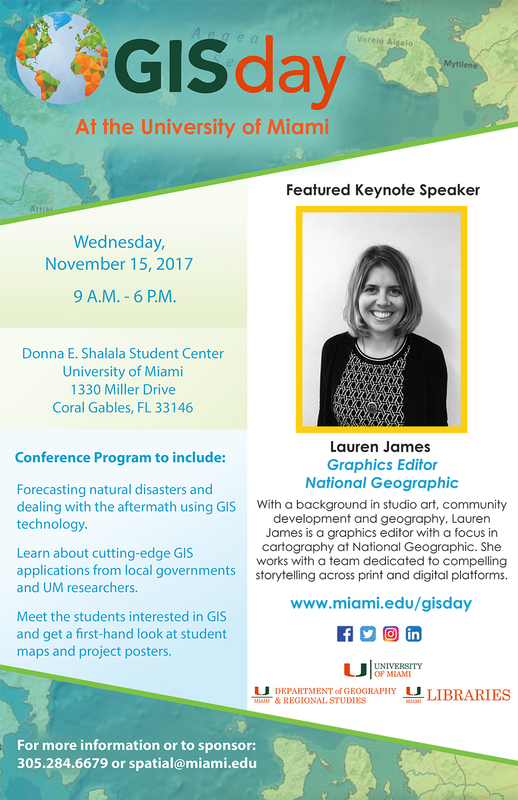 GIS Day at the University of Miami will take place on Wednesday, November 15, 2017, from 9:00 AM to 6:00 PM at the Donna E. Shalala Student Center, 1330 Miller Drive, Coral Gables 33146. Students, faculty, and staff are invited to attend. The featured Keynote Speaker will be Lauren James, Graphics Editor for National Geographic. With a background in studio art, community development, and geography, Lauren is a graphics editor with a focus on cartography at National Geographic. She works with a team dedicated to compelling storytelling across print and digital platforms. For more information, or to sponsor: Call 305-284-6679, or email spatial@miami.edu.